This will bring you to a page with a long list of printers. Add the FollowMe queues by either double clicking the queue or right clicking on the queue and choosing “Connect”. 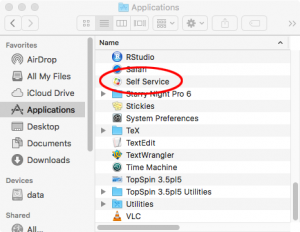 If you do not see Self Service, you will need to enroll your computer in our Casper management system. Here are instructions for enrolling. 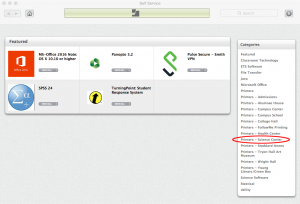 Once installed, open Self Service and choose “Printers – Science Center” from the “Categories” list on the right. All of the printers are HP printers and require the HP printer drivers. All MFD’s are Xerox MFD and require the Xerox MFD drivers. Click on the “INSTALL” button for the printer or MFD driver needed for your install. 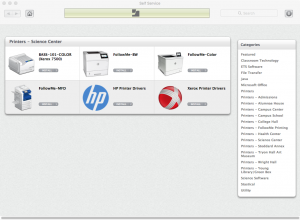 Once that is installed, click on the “INSTALL” button for the printer you wish to install. If you wish to install additional printers, you do not need to reinstall the drivers. The major servers (rstudio, websci, aurora, and zod) have both the BW and Color FollowMe queues installed. If you print from the GUI (on those servers that have one) or from inside an application such as Eclipse or LibreOffice, you should just be able to select the appropriate FollowMe queue and print. If you wish to print on the command line from one of these servers, things are slightly more complicated. lxprint -h, will give you a list of commands and the command syntax. lxprint -p followme-bw -f yourfilename.txt, will print your file to the Followme-BW queue. The MFD queues are not installed at this time. If you need to print from a linux system other than CATS-supplied servers, please contact us for help and further instructions.